To view nav frame at left and columns list above, click here. To display only this frame and view this column full-screen, touch here. American Mah Jongg (the NMJL card). 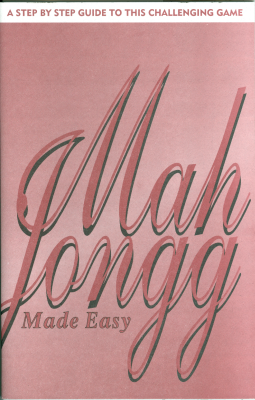 Recently I learned that the League revised its official 1984 rulebook, Mah Jongg Made Easy, in 2013. I immediately ordered a copy, and compared it with the old version. Most changes comprise minor rewording and re-organization. Just showing the major changes herein. P.11 - The whole "clockwise, counterclockwise" question is addressed in all caps: "PLAY TO THE RIGHT, PICK TO THE LEFT." P. 12 - Specific statement to the effect that a... "specific color on the card does not specify a particular suit." P. 12 - Heavenly Hand (not so named in the rulebook) is mentioned: "Exception: If East, who has 14 tiles, draws a Mah Jongg hand, the Charleston is waived." P. 14 - "To claim a discard the player must verbalize their call..." This wasn't clearly stated in the old version. P. 17 - The confusing term "miscalled" is now replaced with "incorrectly named." P. 18 - New wording: "It is up to other players to declare a hand 'dead.'" P. 20 - New wording: "A discarded Joker can NEVER be picked up. IT IS A 'DEAD' TILE." P. 23 - Dealer rotation is now after every round instead of two rounds. P. 29 - The definition of "Soap" used to be "Another name for the White Dragon" but is now changed to "Sometimes referred to as White Dragon." The untrue Confucius myth is still promulgated (page 3). For the true history of mah-jongg, see FAQ 11h. The illustration on page 5, showing Chinese-style red and green dragons, is still incorrect. For correct images of Chinese dragons, see FAQ 7e. I still say that it's important that there be a copy of the official rulebook at every table, every time the game is played. But now that there's a new book available, it's important that the new book be used. Unfortunately, the cover art looks the same as the old book. If you order the book from the League today, you will receive the 2013 edition. But ya takes yer chances if you order the book from another source. If you do that, immediately crack open the book and look for the date on page 2. If it doesn't say "Revised 2013," return it and get your money back. Or you could also easily write the changes in (and in so doing, it should be clearly noted that each change is from the 2013 edition). To read more columns, Click the entries in the header frame, above. Can't see header frame because you're viewing this column in full screen? Tap this icon to see the list of columns with nav frames. Anytime you want to get rid of nav frames, you can just tap a mobile icon. Question or comment about this column? I often, um... intentionally... "miss" something; maybe you'll be the first one to spot it! Email and the discussion will be posted on the Mah-Jongg Q&A Bulletin Board. Hit me with your best shot! and would help keep this site running as a free service. Thank you! Need rules for American mah-jongg? Tom Sloper's book, The Red Dragon & The West Wind, is the most comprehensive book about the American game, including official rules not in the outdated official rulebook. AND see FAQ 19 for fine points of the American rules (and commonly misunderstood rules). AND get the official rulebook from the NMJL (see FAQ 3). Where to order the yearly NMJL card: Read FAQ 7i. © 2017 Tom Sloper. All rights reserved.